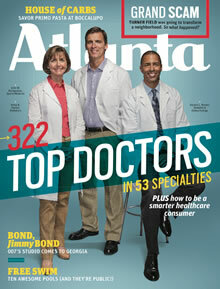 Emory sports medicine physician Dr. John Xerogeanes is featured on the cover of Atlanta magazine's 2013 "Top Doctors" issue. This year, over 150 Emory doctors were selected as "Top Doctors" in the magazine. Nearly half of the physicians recognized in this year's "Top Doctors" issue of Atlanta magazine are Emory Healthcare doctors, Emory Healthcare affiliated doctors or Emory University School of Medicine faculty. The July issue can be found on magazine stands throughout metro-Atlanta. This year, over 150 Emory doctors were selected as "Top Doctors" out of 322 listed in the magazine, with Emory sports medicine physician John Xerogeanes, MD, featured on the cover. Castle Connolly Medical Ltd., a New York-based health care research firm, compiles the list of doctors nationwide representing leading doctors in key regions and cities in the U.S.
"As Emory Healthcare continues to grow, our organization now provides metro-Atlanta and Georgia residents more access to '‘top doctors,'" says John Fox, CEO and president of Emory Healthcare. "With the addition of the Emory Healthcare Network (formally the Clinically Integrated Network) to our Emory Healthcare and Emory School of Medicine family, patients will be able to find both excellent physicians and superb health care closer to home. We thank and celebrate all of our physicians, and the care teams that work with them, for providing top notch care to our patients and their families." The Emory Healthcare Network is a network of physicians and hospitals formed to improve care coordination among its members to improve quality outcomes and manage costs more efficiently. It includes Emory-owned and jointly owned hospitals, Southern Regional Medical Center in Riverdale, and nearly 1,600 physicians (both Emory-employed physicians and physicians in private practice). To compile the annual "Top Doctors" list, Castle Connolly uses a survey and research process involving tens of thousands of top doctors across America and the medical leadership of leading hospitals. Atlanta's top doctors are selected after peer nomination, extensive research, careful review and screening by Castle Connolly's doctor-directed research team. Atlanta magazine uses the research by Castle Connolly to provide detailed information about education, training and special expertise of Atlanta doctors. Doctors do not and cannot pay to be selected and profiled as Castle Connolly "Top Doctors". "The fact that Emory and Emory-affiliated doctors made up 47 percent of all of Atlanta's top doctors this year, and that those doctors were selected by their peers in Atlanta to receive this recognition, says a lot about the skill and expertise of our health care system," says Fox.